Time for another dive into the My Little Game Dev Marathon submissions! Again, they've been reviewed and graded relative to the other games in the competition. Find Pink Pone Action, The Unknown, and Luna Wander below the break! This one's a bit of a head-scratcher. 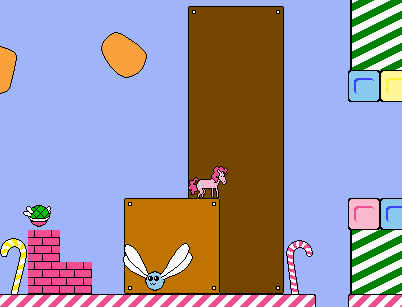 Playing as the long-nosed, unintelligible Pinkepone, the player must traverse a candy-coated level that looks like Super Mario meets Sugar Rush. However, things are not as they seem. A la Cat Mario (perhaps its closest relative) and other unfair platformers, the world of Pinke Pone Action will kill you by any means necessary. As you fall before inexplicably exploding turtles, collapsing ceilings, and invisible blocks, your amount of lives remaining dips into the negative numbers. Like many of its counterparts, Pink Pone Action appears to be a demo for a full-length game - and worlds of frustration - to come. I'll look forward to it. I'm not sure exactly what to make of this creepy little survival-horror game. The player awakens in the middle of a darkened, snowy, evergreen forest with nothing but his wits and a few flares for protection. 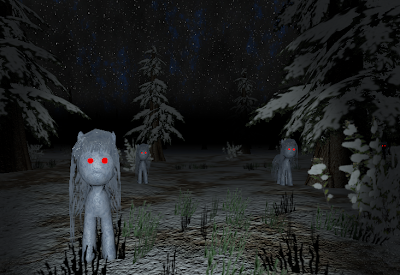 Unfortunately, you're quickly surrounded by strange stone ponies with glowing red eyes. The Unknown takes advantage of the first person medium to add creepiness to your mysterious assailants - they only advance when the player turns away, freezing the instant you sweep your view back to them. Luckily, they're vulnerable to your dwindling supply of flares. The object of the game appears to be to survive for as long as possible, limited to the resources you can scavenge from the ground. Until it gets a plot, The Unknown is certainly good for a scare, but not much else. Among the submissions, Luna Wander takes the cake for world size and perhaps also hours of gameplay (although the latter is tricky to measure). While neither of these can guarantee a game's success, those of you into open-world sandbox games will find a lot to love here. 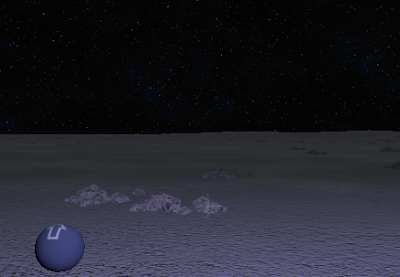 Playing as the recently exiled Princess Luna, the player must traverse the vast three-dimensional surface of the moon and find enough food and water to survive. These demands are met easily enough (especially if one plays in creative mode,) so what's left to do? Check out the mysterious objects scattered far and wide, that's what. Located sparsely across the moon's surface are power-ups to help your exploration, materials with which to build crude shelters, and many other strange objects (which I won't spoil.) Even if you cheat using the included map, exploration will take a very long time - so play if you're ready to submerge yourself in the meditative world of the game for a while. This one's a little hard to grade. At times, I felt lost in the wasteland with little sense of direction and few to no reference points - but I get the feeling that was part of the intended experience. It's not the right game for everyone, but what Luna Wander attempted, it confidently achieves. Update: seems like we've overtaxed MLGD's Dropbox. Here are alternate download links for Luna Wander and The Unknown - Thanks, Jach Marsdonpone!